Located in the core of Suzhou New District, Suzhou science and technology Town neighbors Taihu Lake and is set beside Jiangsu Dayang Mountain National Forest Park. It covers an area of 25 square meters. It was the first large science and technology innovation base jointly developed by the Ministry of Science and Technology of the People's Republic of China, the People's government of Jiangsu and Suzhou government in the country. Since its establishment in 2006 the town has received more than 40 billion yuan ($6.36 billion) in cumulative funding for development. Construction of its infrastructure is basically completed to a high standard. Covering an area of more than 3 million square meters, it contains various innovation carriers, research centers, industrialization housing and other supporting facilities, such as China's “top ten” best service outsourcing park, the national Suzhou New District Software Park, focused on professional medical devices; MedPark, the first of Jiangsu’s professional IC (integrated circuit) R&D parks; Microsystem Park, the first IT (information technology) training base in Jiangsu province; and the Global Institute of Software Technology, the first college incubating students engaging in BPO (Business Process Outsourcing) and software building. Business, life and leisure-supporting equipment are under construction. Elite apartments, new living spaces, the Qingshan Hotel, the Zhiyuan International Business Building, 101 Park, the Jinfeng International Building, EtonHouse International School, Suzhou New District Experimental High School, the Suzhou science and technology Town Experimental Primary School, the Suzhou New District scientific and cultural center and the Suzhou science and technology Town Hospital are rolling out. The Nobel Lake core landscape areas, scientific and technological theme park and Caishi Lake ecological park have formed an open leisure landscape space. More than 100 research institutions, such as the Suzhou Institute of Biomedical Engineering and Technology and the Geo-Science and Technology Service Network, both of the Chinese Academy of Sciences, the Patent Examination Cooperation Jiangsu Center of the Patent Office of SIPO, China Mobile Labs, China North Industries Group Corporation Limited, and Suzhou Industrial Technology Research Institute of Zhejiang University and Communication University of China have settled in the town, as have approximately 400 Top 500 transnational companies, well-known design and development companies and hi-tech industrial parks. Three emerging industries, namely the medical device industry, the software information industry and the new energy equipment industry, have begun to take shape. Suzhou science and technology Town has convenient transportation. Taihu Avenue, Suzhou City Highway and Provincial Highway S230 are all near the town. It also offers more than 20 routes covering the whole city. 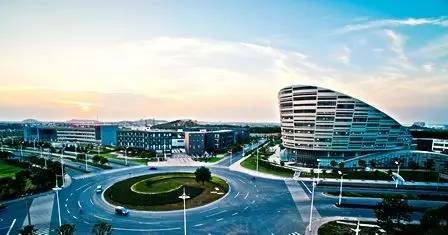 Bus route fast line 3, K44, No 333, No 336, No310, No 355 and No 304 go directly to the center of Suzhou science and technology Town.